Use where needed most - Archbold means many different things to everyone who has visited. Whether a student, academic, professional or nature lover, our goal is to make your experience one that will change your way of thinking about the natural world and being a good steward. Check this box on the Donate Now page to support Archbold in achieving our goal. Research - Thirst for knowledge and an uncompromising commitment to excellence is at the heart of Archbold's contribution to understanding and protecting Florida's plants, animals, lands and waters. The depth, breadth, and quality of its research gathered over nearly 75 years has made it an international icon. It is the trusted standard bearer of dependable research that is guiding conservation and restoration solutions, strategies, and policies, and inspiring students to carry the mission forward for decades to come. Check the Research box on the Donate Now page to support our research programs. Education - Archbold is open to the public and students of all ages. Innovative K-12 curricula, summer camps, post-graduate studies, and adult continuing education programs make Archbold a stimulating, hands-on learning experience. For decades universities have chosen to bring their undergraduate and graduate classes to Archbold. For many students, Archbold provides their first opportunity to explore and study an important ecosystem in a biological station setting that offers a wealth of existing research and invaluable guidance.Check the Education box on the Donate Now page to enrich the lives of our youngest visitors. Conservation - Archbold protects a world-famous preserve, which shelters a globally-imperiled Florida scrubhabitat that is more than one million years old. Since the early 1980s Archbold, in concert with conservation partners, has spearheaded the conservation of this ancient ecosystem, tripled the acres preserved on the Ridge, and is saving its rare plants and animals from the brink of extinction. The 3,648-acre Archbold Reserve is being restored by Archbold. Science-based strategies to improve Florida's water quality are a continuing project. More than one million acres of cattle ranches are in the headwaters of the Everglades, providing habitat for native plants and animals and open space for wildlife movement. Archbold is creating solutions and harmonizing the economic reality of ranching with conservation needs through the management of one of the largest cattle operations in Florida: The 10,500-acre MacArthur Agro-ecology Research Center. 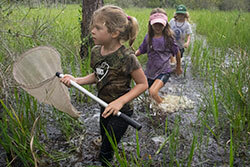 Check the Conservation box on the Donate Now page to support the continued conservation of Florida's lands and waters. Hurricane Irma Recovery - Help Archbold recover from Hurricane Irma, plant new oak trees and redo landscaping to get the Station and Ranch back to pre-Irma beauty. Check the Hurricane Irma Recovery box on the Donate Now page to support disaster cleanup, landscaping and rebuilding for the Station, Ranch, and Reserve.